2004 Mustang - specs, pictures,performance parts and more. The 2004 Mustang was as expected, a carryover from the previous year, yet with the prodigious power supplied in the form of the potent Mach l and SVT Cobra packages, there was still much to celebrate. pony cars, the excitement generated by these performers kept sales much higher than what you'd expect with a completely new model coming out the next year. After all, there had been a buzz around Detroit and the motoring world about the beautiful 2005 Mustang concept car, seen as early as 2003, was destined to become extremely close the the original concept car. 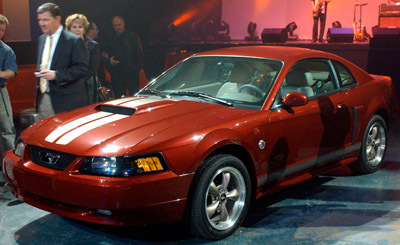 Nonetheless, the 2004 Mustang had enough performance and excitement to carry it right into the next model year. Styling and exterior appointments for the 2004 Mustang remained virtually the same for not only the base car, but also the standard coupe, convertible, Mach l and the SVT Cobras. 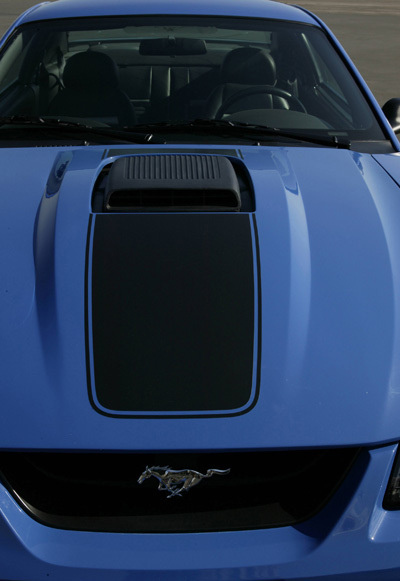 A special 40th anniversary Mustang package (as seen above) was offered, which sported special stripes on the hood and lower sides, a special badge and paint options. 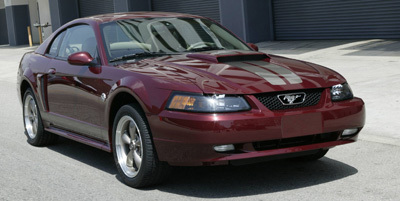 The 2004 SVT Cobra was also available in a special paint option, called "Mystic" which was a unique color shifting paint that depending on the amount and degree of light could produce shades that ranged from a deep black, to purple to green color. 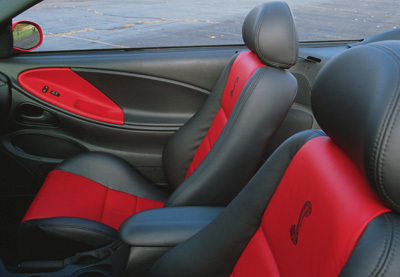 The Cobra interior retained it's already great looks and the only significant interior change on other models was in the 40th anniversary package, which featured an upgraded interior and logos on the floor mats. 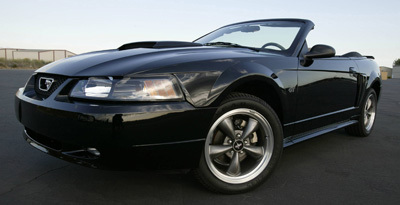 Engine choices for the 2004 Ford Mustang remained the same as the 2003 offerings. The base 3.8 liter V6 produced 190 bhp, while the 4.6 liter SOHC (single overhead cam) modular V8 offered a strong 260 horse power. 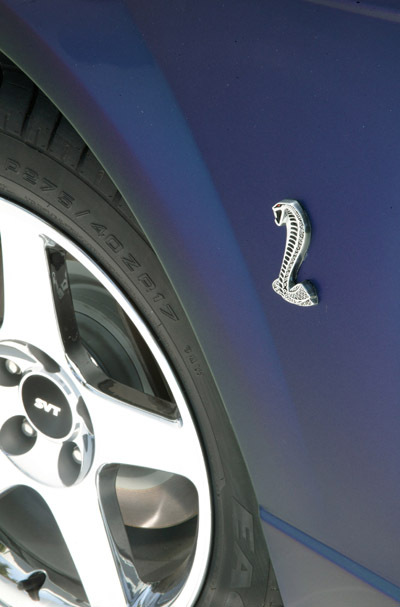 while the SVT Cobra's aluminum 4.6 liter V8 churned out a conservatively listed 390 horse power. Although curb weight no longer seemed a factor, given the incredible performance numbers, the cars were reasonably light weight at approximately 3,000 to 3,300 lbs. As an interesting reference, the 1973 Mustang with the 351 cubic inch (5.7 liter ) engine and 266 horsepower, could run a best time in the quarter mile of just under 16 seconds and weighed 3,560 lbs. The Mustang SVT Cobra weighs in at just over 3,000 lbs and with its 390 horse power engine, rockets the car to times in the high 12's to the low 13 seconds. Who says the good old days are gone? One of the known issues for the 2004 Mustang, including the SVT Cobra and GT cars, are leaking oil coolers and oil showing up in the expansion tank on cars with higher mileage. Here's a link to an issue and solutions for a 2004 Cobra oil cooler problem. Copyright © 2009-2015 OnlyMustangFords.com No reproduction of any part of this site is allowed without the express written consent of the owner.